Where did I get it? I don't think I mentioned this, but I've got a challenge going on in 2016. My friend Lucinda has gone to study in Canada and when she visited in December she lent me some books. (We also got tattooed!) I've decidedx that I'll try to read one of those books every month. She picked ones she thought I'd like, but that I'd never pick up myself. I'm into contemporary realism and she's more into fantasy stuff. But when I looked at all the books I thought they all looked pretty good! What's it about? Mina has been homeschooled for a while now due to a bit of a breakdown at school. Her dad is dead and she lives with her mum, who's been seeing someone new. She doesn't fit in at school (which resonated with me) and she spends a lot of time sitting in a tree. From there she can see a new family moving in to the street. This book is apparently a prequel to Almond's earlier novel Skellig which I bought on eBay. The book sort of changes a lot - it's a difference of styles and formation. I liked this a lot, it felt right for the character. Are any main characters disabled either mentally or physically? 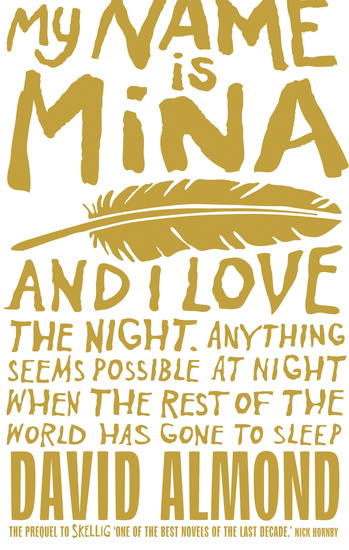 I think Mina has some kind of mental illness or she's maybe autistic, but it isn't mentioned or discussed - but readers may identify with her. Is there any talk of death? Yes but it's very age appropriate. Where is the book going now? Back to Lucinda when she's back!